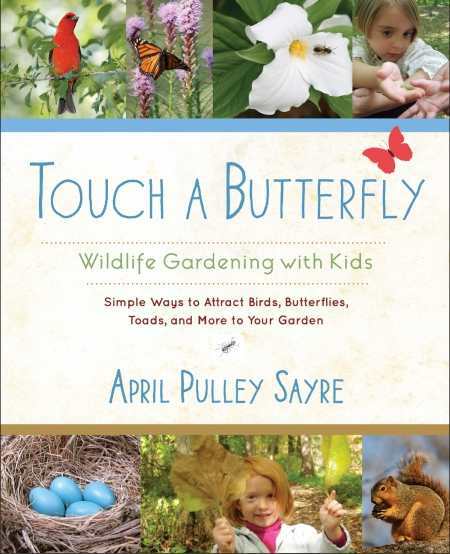 At the start of her lively guide for wildlife gardening, author April Pulley Sayre asks a provocative question: “Are you that family? The slightly wild one, with wide-eyed, active kids, always into messes, ready to explore?” Even if that description doesn’t fit, Sayre’s advice for creating a garden of wonders will be useful, especially for bringing out the wild kid in anyone. Sayre provides valuable, accessible insight into developing a garden suffused with wildlife such as birds, lizards, turtles, butterflies, and even quail and hummingbirds. She emphasizes that it’s not necessary to have multiple acres available for an ersatz wildlife preserve; in fact, smaller spaces can be beneficial for creating a sense of abundance. Organized as a series of steps toward an eventual wildlife garden, the book provides suggestions for hands-on activity in a way that isn’t intimidating. When planning a garden, for example, Sayre recommends knowing basics like soil type, wind patterns, and water supply sources, then she gives straightforward advice on determining how these elements will affect a garden space. Throughout, Sayre’s upbeat, encouraging tone and clarity are ideal for a project as potentially overwhelming as creating an intricate garden space with kids involved. She sometimes shares her own experiences sitting in her gardens among the butterflies and dragonflies; the gentle memories can serve as inspiration to continue the planning, planting, and tending needed. In addition to delivering thoughts on garden creation, Sayre also shares information on various creatures likely to reside in the wildlife space. Although she covers a vast array of insect and animal life, her quick-hit facts about each are often enough to give readers what they need to know. In our digitally driven age, many experts bemoan the loss of connection with nature that’s afflicting our populace, particularly children. By creating a wildlife garden, Sayre believes, anyone can create that connection without having to take a vacation or trek to the woods. “In a world where people who love nature can get tired out with news and statistics, the wildlife garden is a place where we restore ourselves and nature,” she says, adding that it provides moments where kids can watch squirrels or simply soak up the sun. It’s a compelling argument for taking the first steps toward becoming that family.